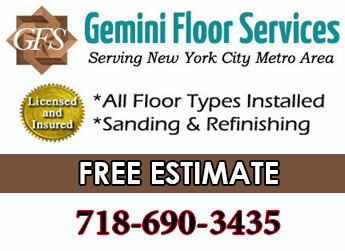 If you’re looking for hardwood flooring Gemini Floor Services is centrally located in Brooklyn and serves the 11230 Brooklyn neighborhood of Midwood. Midwood is another suburban like part of Brooklyn. You got tree lined streets, detached homes with yards and driveways, easy parking plus peace and quiet. Unlike other neighborhoods to the south though, Midwood has it’s own subway stops. It’s 45 minutes into Manhattan. So you get the best of both worlds. It’s away from the crowds with convenient access to the action in Park Slope or Manhattan by the F or Q train. Midwood is a diverse ethnic middle class neighborhood with a strong presence of Orthodox Jewish folks. There’s many Jewish synagogues, schools and businesses. Saturdays are very quiet while many businesses close in religious observance. Like much of the South side of Brooklyn it’s not considered hip and trendy. There’s no lightlife scene. It’s old school Broooklyn. Midwood is family friendly and safe. 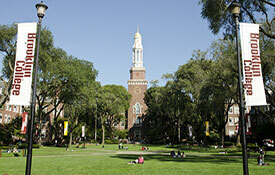 Brooklyn College is located in Midwood. Also tv’s NBC studio has been there since 1953. The streets and homes of Midwood have portrayed the classic image of Brooklyn as many tv shows and movies were filmed there. The neighborhood has charm with well maintained homes. There’s plenty of classic Brooklyn brownstones as well as a varied mixture of architectural styles. Some of Brooklyn’s most upscale homes are located in Midwood Manor, the most affluent part of Midwood. Shopping is plentiful with several commercial streets. The main shopping areas are on Coney Island Ave, Kings Hwy, Avenues M & J as well as Flatbush & Norstrand. You have many old time local family owned owned ethnic shops. Dining is diverse. Eateries offer the classic tastes of Jewish, Italian, Russian, Turkish & other foods. Old school deli’s & pizzerias are common. 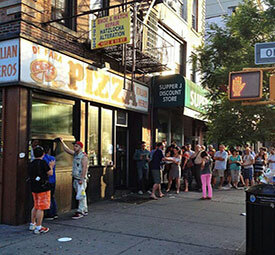 The very famous DiFara Pizza draws visitors out to Midwood just to try the Pizza. Like Grimaldi’s Pizza by the Brooklyn Bridge people wait in line for hours and pay top dollar. Though there’s not much going on for green parks in Midwood, Marine Park – Brooklyn’s largest park, is right next door within a few miles. Plus Ocean Pkwy runs through Midwood. It goes 5 miles from Prospect Park to Coney Island with wide pedestrian lanes on both sides ideal for walking & biking. Also there’s nice pedestrian meeting spots through the neighborhood with benches and tables. Altogether Midwood is a pretty nice neighborhood for residents. We enjoy visiting the different neighborhoods of Brooklyn as we install floors throughout the borough. So much diversity and variety. It’s like flooring, which also offers so much variety.